Dragons in the Persian tradition differ from both the Western conception of an evil, flying monster breathing fire and the Far Eastern image of a powerful but often benevolent creature resembling a giant snake. 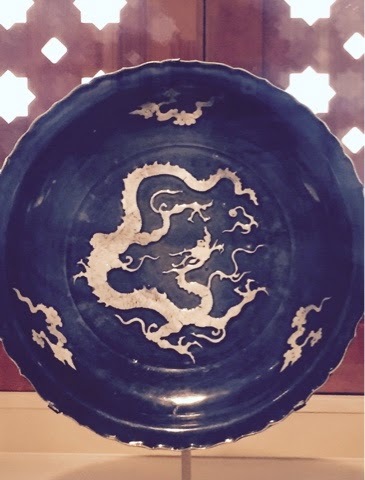 Although Persian dragons more closely resemble Chinese dragons in description, they are usually seen as malevolent, and possessing both human intellect and often, a lust for power. The source of the modern Persian word for dragon, ezhdeha (اژدها) is Azi Dahaka. a three-headed monster mentioned in the early religious texts of Zoroastrianism. Zoroastrian scripture also mentions other dragons, or Azi, including a yellow dragon who spat venom, and a red dragon who brought on a deadly winter. 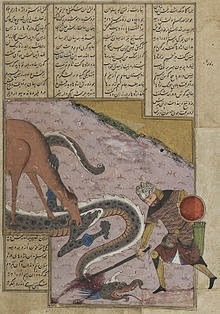 In the Persian epic the Shahnameh, Azi Dahaka’s legend was transformed into that of Zahhak, a handsome Arab prince who fell under the influence of evil and grew a snake from each shoulder, each of which could only be satisfied by eating human brains daily. Even though Persian dragons were a negative force, they were sometimes used as a symbol on war banners, to frighten the enemy.